The Medina County Bicycle Club has offered a new service on their website called "Ask the Mechanic." Don, our Medina Service Manager is fielding questions from Medina County Bicycle Club members and visitors to the website. 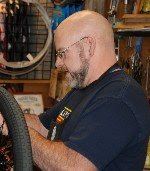 Century Cycles Medina is proud to be able to offer this service to Medina Bike Club, and if you have any questions about your bike and are looking for a convenient, easy forum to get those questions answered, head on over here and ask Don!